My wife is a big tea drinker, so I decided to raid some of her supplies for this French Press experiment. And I soon found a problem – she prefers to go through her teas one pack at a time – so while there were some very interesting packs of loose leaf tea there – Earl Grey (which I wanted to use) and a tea that promises to taste like cake – none of them had been opened. And wouldn’t be opened until she’d finished her pack of Chinese gunpowder tea I brought home from Melbourne last month. Which left me with the rather unenticing option of using tea-bags for this experiment. 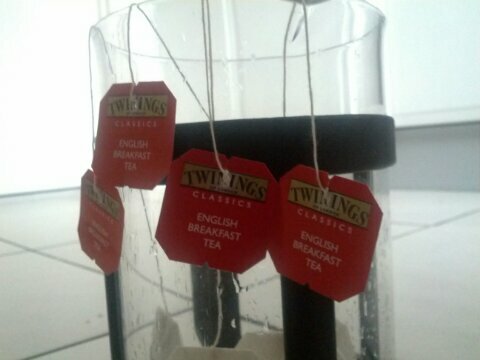 I’m no tea expert but I’m smart enough to know that the tea in bags is crap. You want good flavoursome tea – go the loose options. Anyway, I dumped in four tea-bags of Twinings English Breakfast tea into the French press and poured the cheap Arc Valley lager on top and let things steep for about five minutes. The aroma when I poured it in a glass was noticeably tea-like. Made me wonder what it would be like if I’d left steep for 10 minutes. The flavour was intriguing. The unadulterated lager had a distinct malt hit right in the middle of the palate. In the version with the tea, that was absent. It was like the tea had totally paved over it. In its place were the distinct tannins from the tea and an interesting peach flavour, which lingers. It wasn’t too bad for some ordinary supermarket-bought tea. It has piqued my interest in what would happen with some good quality loose-leaf tea.